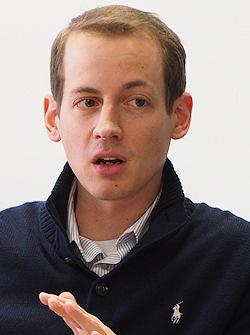 Joshua Mortensen, '13, returned to Washburn University School of Law on March 27, 2018, to lead a small-group Transactional Lunch focusing on non-disclosure agreements. Mortensen has worked at Garmin International's Olathe, Kansas, offices since graduation, first in international trade compliance and now as corporate counsel. The Transactional Lunch format enables a small group of students to learn about a particular type of transactional document or issue from a practicing attorney in a workshop environment. Mortensen taught a group of 1L, 2L, and 3L students about the provisions of a mutual non-disclosure agreement. He frequently works with such agreements in his practice, and first explained the circumstances and negotiating priorities of the parties. He then went on to discuss the differences between one-way agreements, mutual agreements, and multilateral agreements. The rest of the lunch hour was spent walking through the model document Mortensen had provided to the students in preparation for the lunch. Issues such as the application to affiliates, when written requests should be required, backdating, survival of the obligations, and the application to continuing development activities were discussed. Most importantly, Mortensen explained the crafting of the "confidential information" definition, and the impact of the "purpose" specified for the agreement. 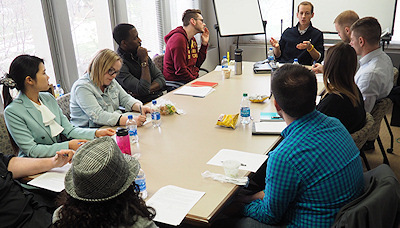 The Business and Transactional Law Center thanks Joshua Mortensen for taking time from his busy schedule to speak with students about this real-world issue in legal practice.